LG 37LF7700 review | What Hi-Fi? There's a new Freesat TV in town and, for once, it isn't made by Panasonic. This 37incher is part of LG's new LF7700 Freesat range of LCD TVs. The design is typical LG: streamlined with a touch of style. Also familiar from LG's most recent TVs are speakers tuned by hi-fi supremo Mr Mark Levinson. To its credit, the 'LF7700 sounds relatively smooth and rich by flatscreen standards – though push it too hard and you can hear distortion creep in when the on-screen action heats up. The screen is Full HD resolution and 50Hz (only the 42 and 47-in versions are 100Hz). 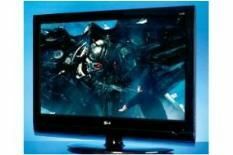 The TV uses LG's Dual XD picture processor and Intelligent Sensor II technology. The latter automatically adjusts the picture depending on the light levels in your room; a neat energy-saving system. However, sadly for the planet, we achieved the best picture quality with the sensor turned off. Set up is simple: the LG's on-screen menus use clear, bold graphics to point you in the right direction, while the remote control also features a handy selection of shortcuts. Using the TV's Freeview tuner results in a competent image. Detail levels are decent in comparison to other sets in this test, while colours are especially bold and vivid. Switch to Freesat and overall image stability and insight moves up a level, but the colour balance is still overly keen. HD content such as the children's programme In The Night Garden shows good clarity and three-dimensionality, but the movement of some of the crazy colourful characters shows that this LG's not immune to judder. Faced with a 1080p/24fps Blu-ray image and the 'LF7700 puts in a solid showing. Detail and black levels are competitive enough at this price point. Our only concerns go back to the TV's colour balance and motion-handling. In Hancock, Charlize Theron's skintones either appear overly rich or washed-out: it's hard to achieve a truly satisfactory balance. And, with the tricky pan around Hancock's trailer and its location, you notice a staccato movement that isn't visible on the top performers in this class. If you're looking for a Freesat set, consider this appealing LG alongside rival Freesat models from the likes of Panasonic.